Isn't the bride beautiful? 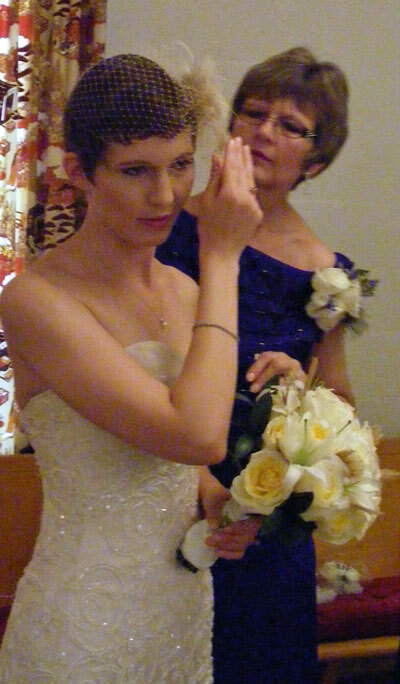 This is my step-daughter Amanda who married in Little Rock this past weekend. Her mother is helping with her headpiece. This is our third major family wedding in the last few years. Along with my parents 50th Anniversary and assorted other family events, I've learned a few things from friends and from my own experiences about what works for me in photographing Big events. This will NOT be technical at all. I'm certainly not a professional photographer - a struggling amateur would be a good description. • The best photos are often the spontaneous shots made by non-professionals. Certainly a professional photographer is invaluable, but my favorite three photos from my own wedding were made by friends. The photo above was not posed. I just stood around snapping things that looked interesting to me. • Ask a couple of friends to bring their own cameras and encourage them to take photos. You’ll be amazed at what different things you end up with because everyone has a different point of view – literally! I think people take the best photos with their own cameras rather than those little disposable things. My friend Phyllis took the only photo of a pretty photo display we did at my wedding. I was very grateful for this keepsake. • Take close-ups of flower arrangements, favors, and other inanimate objects. 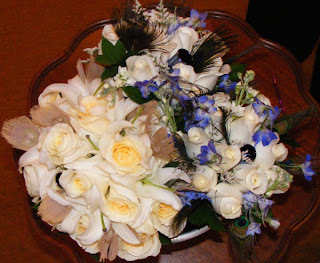 The bouquets were resting in water on a side table in the brides room when I shot this one. This photo can be used on the CD label for the photos I'll share with the bride, her mother and sister. It would also be pretty in transparancy behind other pictures and journaling on a scrapbook page. • Even if you are way across the room from your subject, don’t hesitate to take a shot of something. For this reason, I always keep my camera set at the highest resolution at events. You never know what tiny piece you want to crop out of a picture and that high resolution helps. You can resize down but not up! • Stay out of the professional's way. I take some of the posed shots myself but I do it quickly and if possible, with the flash off. Make lots of photos of the crowd and decorations. These are pictures the bride and family will want but not necessarily at a professional price. Use the close-up feature on your camera to get small details like the wedding cake topper. The wonderful thing about digital is you can take as many photos as you like and always delete them later. Yesterday, I downloaded Amanda and Matt's wedding photos and immediately made a backup of those. Now I can edit as much as I like and know the originals are safe. Lastly, put the camera down some and have fun, too!